The 1221VS is different from anything JET has made before. In truth, it's different from anything that anybody has ever made before. The design is better. The features are better. The entire turning experience is better. And it all focuses on one concept: control. There is an additional $75.00 shipping charge for this item. Estimated Delivery time: 15 business days. 15% restocking fee on all returned merchandise. (2) Tool Supports, 6" and 10"
Swing Over Tool Rest Base: 9-9/20"
I have my new Jet lathe all set up and bolted down. but I have not used it yet. I am sure it is going to work like a nice dream. 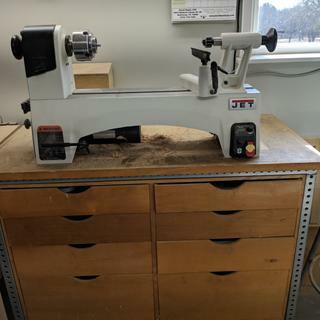 I had looked at alot of lathes and this one fit my needs, works fine for me. Lots of 'Special Promotions' going on. Ian, on staff, was very helpful sorting through the variables. The store was out of stock so I ordered 'instore'. That didn't work out very well. No one, from Rockler or Jet were able to tell me when it would be delivered. "Within 15 days" from Rockler. It showed up one day without any notice. On the other hand I went through the same process with the stand and everything worked out great. Emails confirming the order, shipping and the tracking number. I'm glad I chose the Jet 1221VS. I owed a older Jet lathe the same size previously. I liked it but this newer model has features such as variable electric speed control and reverse turn direction feature. Most desired rpm speeds can be achieved through the electric speed control vs needing to change the belt pulleys. Reverse allows a better job of sanding at times. We love this lathe. It is all we hoped it would be. Beginning woodworker, bought to make pens. My first pen turned out great. Gave it to my wife as present, she loved it and couldn't believe I made it. Setup of the lathe was very easy, quality of product is excellent. Great lathe for turning pens and bowls. I have shopped around and visit my Rockler store in Arlington, TX. Staff was very knowledgeable and answered my questions. Within minutes my lathe was ordered and on its way. It been since high school since I last played on a lathe. Well the picture shows a goblet I made from a video on You Tube. It works very well. It is smooth running and I love the digital rom readout. I am very happy with it. High quality construction. Price fits my pocket book. This is the second 1221 I have purchased. First one burned up in a wildfire. The downsides for the 1221 are that it is small. You can't turn long spindles because of the short bed. 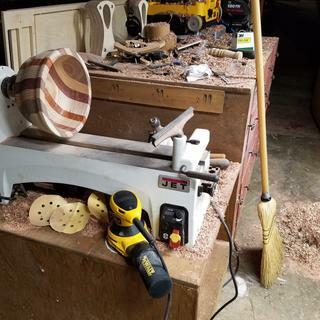 The short bed also means the tail stock must be removed to give me elbow room when I'm turning bowls. These issues aren't complaints as I knew what I was getting into. I've owned a lathe for years but wanted to turn uneven burls. This lathe is smooth, powerful, quiet and most importantly has the ability to turn at very slow speeds. 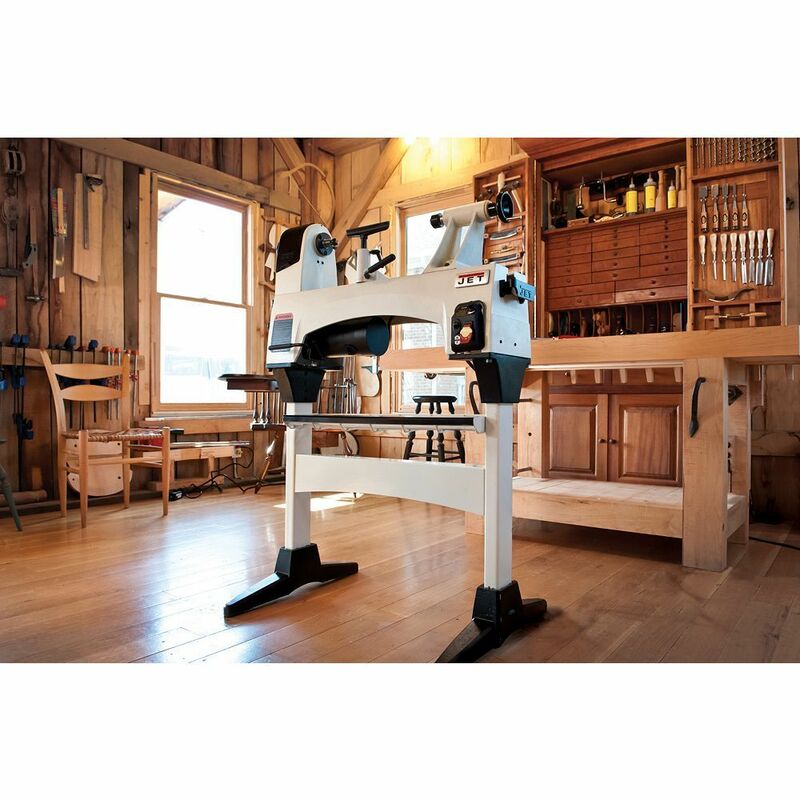 Most lathes that turn anywhere near this speed are usually thousands of dollars. This one is much closer to my budget. 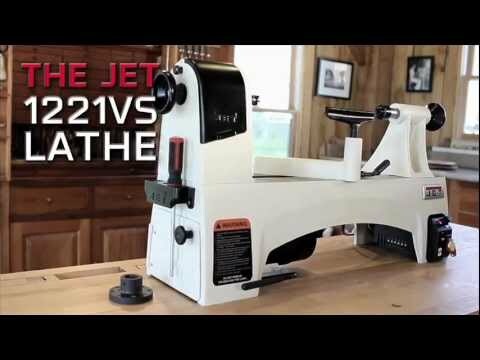 I purchased the Jet 1221VS lathe after my wife and I took a bowl turning class at the Novi, MI store. 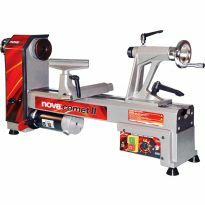 I had previously purchased the Nova Comet II lathealso at Rockler. We are both beginning wood turners. The largest bowl I have turned so far is 7” diameter. I find that the extra power of the Jet gives it a small advantage over the Nova. I also like the digital display of lathe speed. 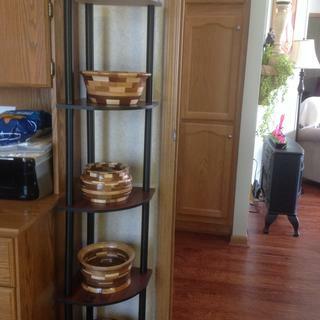 I'm a novice turner, but have been woodworking for a few years. Jet is a good brand, and this lathe has been great. No problems with it and pretty much ready to go out of the box. Fit and finish were perfect for mine. There's a couple of things that I've been loving, that aren't necessarily specific to this lathe. But the ability to use my offcuts for pens or other small/thin items is really nice. Also, we just had our second kid, and I don't have as much time for big projects as I once did. 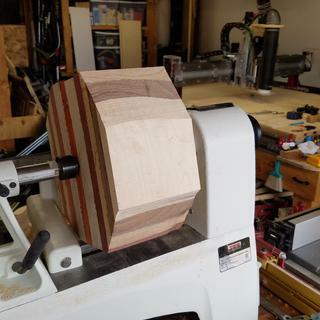 The lathe lets me start and finish a project quickly, which has really let me scratch that itch to make something or do something. Very pleased with my purchase. It runs so smooth and quiet that you barely notice it's running. A real pleasure to operate. Very satisfied with my new Jet 1221VS Wood Lathe. This is my upgrade wood lathe. 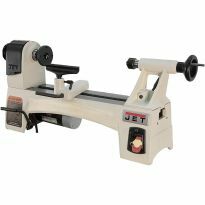 I previously owned a Jet Mini Lathe which was OK but I wanted additional features. I'm rather new at wood turning but I learn something new each day and this new lathe makes it a bit easier. Happy I purchased this wood lathe and would recommend this lathe to others. 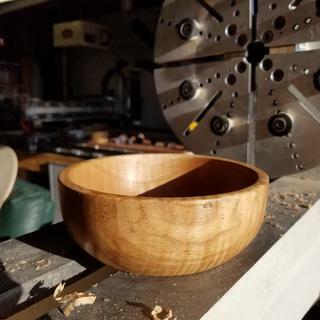 Was able to make some great bowls on this lathe! Best midi lathe you can get. I first got the Nova and it was disappointing - I returned it for the Jet and couldn't be happier. 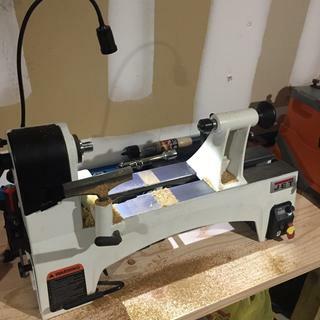 I have an OLD Craftsman lathe and I decided to upgrade my lathe with this Jet. It is a wonderfully simple machine to use and all the pieces actually came in the box! Love this Lathe, bought the extension for it and everything about this Lathe is great. Made my own stand as the Jet stand is really pricey. Bought it a couple days ago. Decades of woodworking experience but new to turning. Love the electronic variable speed, much easier than moving belts. The center to center distance with the stock drive spur and the live center is really closer to 18" otherwise I would need to back the tailstock partially off the bed. Thinking of getting the bed extension. Collecting lathe shavings and dust is a challenge - I have 2 Jet dust collectors including a ceiling mounted unit. Still have to do some sweeping. I have had no lathe experience in the past. 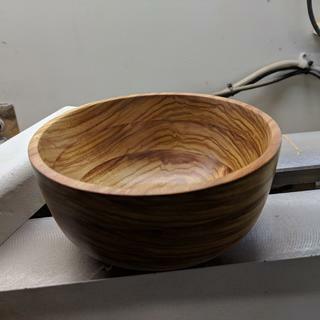 Took a beginner course from Rockler and have started turning a bowl. What fun! So far I really like the Jet 1221VS lathe. Great lathe. This is a second one and love them. So far it has worked well and fits my turning needs. Great so far in every way. This is a fantastic product for the price. Everything that matters is stout and I've have yet to find any deficiencies. As a first lathe this was great choice. It's for sure a rabbit hole but I'm glad I went down it. It great and has good flexibility . Breakdown: Indexing Head - Extremely Solid and unbelievably smooth Bed - Solid and accurate Electronic RPM - Great for repeating a perfect cutting speed Comes with all of the tools you need to make any adjustments This lathe is a professional quality product, If you're going to spend money on a Lathe and want something that will produce amazingly accurate results with plenty of power, this is definitely it. I added a one way chuck and drill chuck to my setup and can produce just about anything with it. If you have any doubt rest assured you will be 100% happy with this lathe, and I love the way it looks in my shop! I am just learning how to do wood turning and my Jet is a very good machine to begin on. I am going to work with a local woodturning club to increase my knowledge as quickly as possible. This is my first lathe, and didn't know a whole lot about them when making the initial purchase. After looking at several in the store I could see the benefits that Jet put on this model and am glad I went with this model rather than a lower end one. The variable speed is great and not having to move belt around all the time makes it easy to go from turning, to sanding, to applying finish. It has a nice spin up, stops quickly. After putting a few hours on it there seems to be a once per rev "tick" coming from the belt, I haven't figured out what's causing it but it doesn't affect performance. My biggest complaint is that the sticker/plastic cover over the LCD rpm display has gotten a bunch of wood chips behind it because it wouldn't stay attached. I wish I had noticed earlier and put a little glue on it. Nice mid size lathe. Variable speed adjustment is lose and very sensitive. Jet customer service told me all adjustments where this way. Seems like a flaw in design. Will not be able to do large lathe turnings. And keep in mind once you get a lathe you have to buy additional tools / parts to make it useful. solid, stable machine. no complaints at all. convenient controls, very smooth operation, weighty for it's class. I'd recommend it. Replaced my Jet 12/20 with this lathe. Love the variable speed convenience. One of the four holes for mounting the base of the lathe to a bench was unusable because it was just an irregular and off angle hole. Three attachment points should hold it but I was disjointed with this aspect. The lathe is fantastic however, it took 22 days for me to receive the lathe. Very slow shipping. I set up the lathe and it is very convenient to use and suited my needs, however after less than three hours of run time the printed circuit board failed. Now I am dealing with JET for the circuit board replacement, plus install it myself. Not the quality I expected from a JET product. If you are considering a JET product be aware that they have a quality problem somewhere in their design-production process. First lathe for small shop. I have been using my 40+ year old Shopsmith Mark V and love it dearly. However...for turning pens, seam rippers, bottle stoppers, and the like, the Shopsmith just isn't giving me the same flexibility and precision that I enjoyed back in my days of teaching Jr High Industrial Arts when we had a nice Rockwell lathe. So, I'm stepping up! To turn bowls, pens, and handles. I like the 1 hp motor for bowls. I have been using an old Jet 1014 VS mini lathe for several years for pen making. It has performed flawlessly for years with no problems whatsoever. 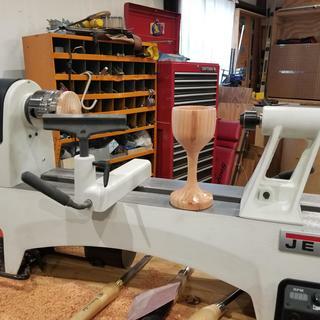 I've recently gotten into making bowls and some larger turnings and although the 1014 has worked fine, I thought it was time to upgrade to a little larger machine. I really am looking forward to the newer, larger lathe and especially the reverse capability. I used one in a training class and it was a very good product. It's a Jet. It's under $1000. Rockler had a sale on Jet items. A person can't go wrong buying a Jet on sale. Brand reputation and store demonstration. Really liked using this product. I was at a woodworking show and every one there doing demonstrations was using this lathe. Four different skilled woodworkers can't be wrong. Our club teaches middle school classes in the summer covering basic woodturning techniques. We currently have 4 Jet 1220VS lathes but we have 6 students in each class, so we needed to expand our lathe inventory to cover the classes. 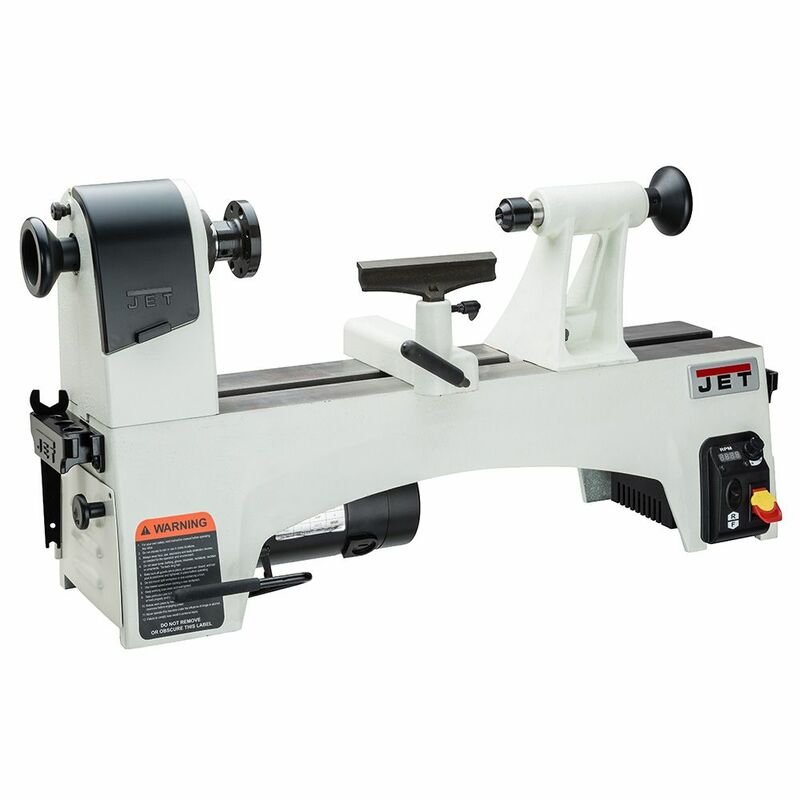 Saw a demonstration at the Arlington, TX, store, and decided that this would meet my wants more than the other midi- or mini- lathes that I spent way too much time looking at, inspecting and reviewing. The fact that it was on sale helped, but was not a deciding factor, although it left me with a sufficient amount of money in my budget to purchase the Nova G3 Comet Reversible Chuck. Getting started with turning and think this is the best mini lathe made. I chose the Jet 1221VS because Jet makes a quality product. I have a Grizzly 10" lathe but I wanted something a little bigger and more powerful. I make custom game calls and have been using a harbor freight lathe, decided to upgrade and this was highly recommended. 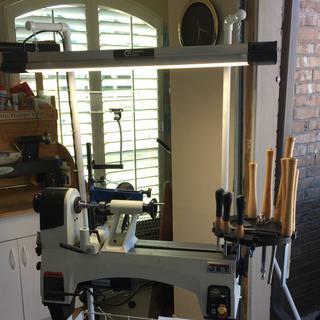 After reviewing several different lathes and through the reviews and word of mouth, I chose this model lathe as my first lathe. rated best in it's class and now with the sale it became a wise choice. I am adding tools to a resident shop where I work. The residents specifically asked for this tool. Price was better from this supplier than others. I've had a Jet mini 1014 lathe for 9 yrs. with no down time, haven't even needed to change the belt. I've made over 600 pens on this lathe. Jet makes a quality product. When you're making a product you need reliability. By the reviews and was recommended by a friend and seems to be the right one to start a new hobby for me. I have a Jet 1015VS and like it very much. I wanted a bigger lathe, so I ordered this one. What chuck is compatible with the reversing feature of the Jet 1221vs? BEST ANSWER: One which has a set screw which secures the chuck to the drive spindle. Without that, the work piece will unthread itself when the lathe is shut off and the dismount **will** ruin whatever you've spent so much effort creating. I learned this the hard way due to the omission of that little fact from the manual. I now own a Delta 46-460. I'm thinking about buying a new lathe. I'm not trying to upgrade, I think this lathe is a good comparable to the Delta, I've read many great reviews. I do mainly smaller turning projects, have had some minor issues w/ the Delta, thinking seriously bout this one to replace it. Somebody help me decide. My question, is it as good as the reviews state? Help me Jet owners. BEST ANSWER: I have one and it performs very well.I will be soon be buying the bed extender.The reverse speed is very helpful for turning bowls and round boxes,as well as sanding.My answer to your question would be its as good as represented.I have a wood working shop and its as good as any tool that i own and i only by the best. yes it is. I own one and besides that I am a high school woodworking teacher and I have 2 of them in the shop at the school. They hold up to the uses and abuse of teenagers!!! That is what prompted me to buy one for my home shop. WmB... Thanks for the feedback! 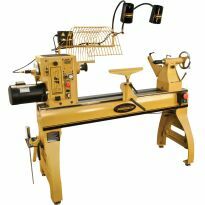 The Jet is an excellent lathe, in fact the Ohio Valley Woodturners Guild just purchased 8 of them to outfit our new Woodturning Learning Center in Cincinnati. John, thanks a ton for taking the time to reply. You fellas have helped make my decision on the Jet. I love my 12-20 VS. I use it for pens, bottle stoppers and small bowls. The variable speed is fantastic, so easy to use. will this lathe work with the rockler duplicator ? 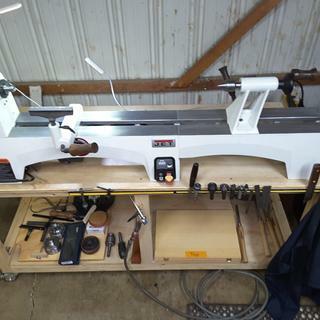 I haven't used one personally but the specs look like it will work with any lathe, and the picture showed a Jet. Not sure what model. I would confirm with a Rockler person for sure, but now I want one! Can this bore a center? BEST ANSWER: I use a jacob's chuck in the tail stock to bore mandrel holes. It works well for that application. Definitly yes. Using a drill bit in a Jacobs type chuch works very well. with the proper chuck, there should be no problem! BEST ANSWER: I agree, a lift gate would be on the delivery truck to be able to get it to the ground. My lathe was placed on a manual fork lift and lower via a truck tail gate. Since it as on a hand operated fork lift the driver was nice enough to push it up the paved drive way to the garage. You could manage it yourself if you have anything with wheels or a couple strong backs. Would't pay extra for a lift gate as you can manage it. No, two people can lift it in and out of the SUV/Truck. This thing weighs +200 lbs. If you don't have a loading dock to unload it you will need a hydraulic lift, or at minimum 2+ people to lift it. BEST ANSWER: Raul, No, this lathe will not allow you to turn a standard length table leg. The second number, 21", in the description indicates the length of a piece of wood the lathe can accommodate. 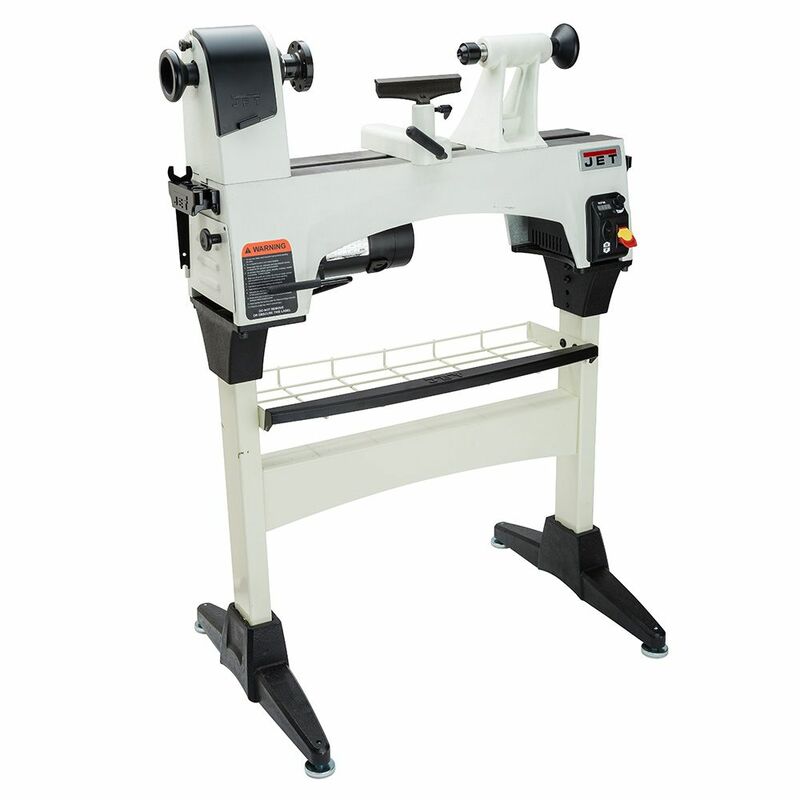 However, you can also buy a bed extension for this lathe that will allow you to turn longer pieces. JoAnne S.
Thank you, so an extension would do it then. 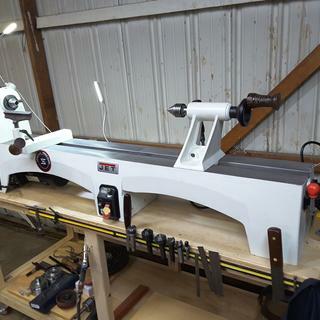 Yes, the bed extension JET sells for this lathe extends the length of the bed to 42"...more than enough for any standard sized table leg you might want to turn. In fact, I intend on buying one for my lathe next month when JET has their big 4 day sale starting on January 8th. Thanks Russel, so I found the lathe, the bed extension but couldn't nail down the leg extension for the lathe. Any thoughts? I also found out the following when I was researching to buy my own bed extension and leg. It appears that Rockler sells the bed extension, but not the leg extension that you'll also need to attach the bed extension to your lathe. I talked with one of their technical reps when I couldn't find the leg extension on the Rockler website. After checking their database, he told me they didn't sell it and it must be some glitch they hadn't caught yet. 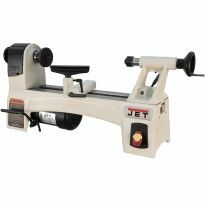 In any case, I found the leg extension for the JVS 1221 lathe for sale on the Woodcraft website and am ordering mine from them once the JET sale starts on January 8th. The $109.00 price I previously told you about is from the Woodcraft website. 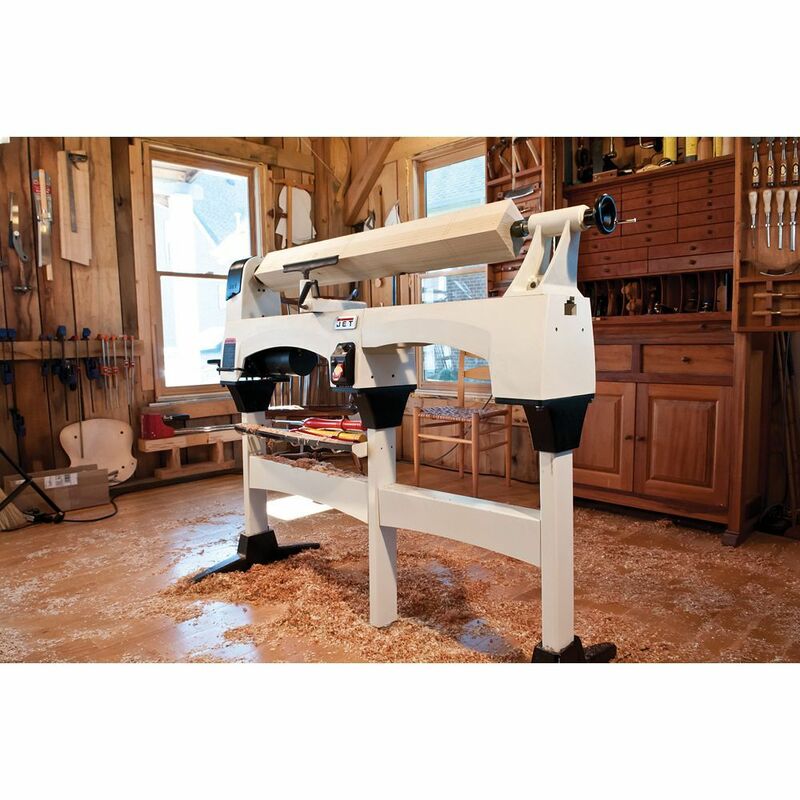 This lathe will accommodate a turning up to 21". To do a piece larger than that you will need to have the bed extension add on. Also one has to remember to allow for the end cut offs after you part the piece. 1221VS 12" x 21" = 12" diameter by 21" long material capacity. A 22" bed extension can be added for a total material length of 43". I believe the longest is 21" without an extension bed. Thus lathe is definitely powerful enough to handle it though. Thanks John, you guys have been amazing. New to wood turning...is lathe too big to turn pens on? BEST ANSWER: No works great for pens and smaller bowls, etc. Variable speed is a plus. Only issue I have is the variable speed knob is loose. Jet representative stated normal but I do not believe him. As of now the knob issue has not affect operating the lathe. Keep in min a smaller lathe and not for large projects. I had a 900 pound 4224 PowerMstic that I turned pens on before getting this one. So yes, it does a superb job with pens. Not so much with larger bowls. Do what you csn to dsmpen the vibration. I am not a pen turner but I believe this lathe is not too big to do the job. On the other hand, if you are going to turn pens only, it is much bigger than necessary. Clyde, I have turned quite a few pens on my 1221vs. You can turn small bottle stoppers up to about an 8" bowl. This is a great lathe. because I do not turn pens I can't be sure about the answer. However, I don't see why you couldn't. 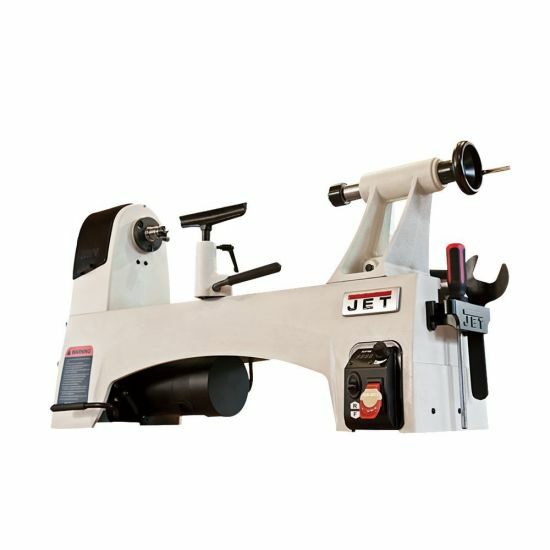 It is a very versatile lathe. No. It has more capacity than you''ll need for pens but is not too large to easily turn them. It's a great lathe. What type of variable speed control system does this lathe employ? BEST ANSWER: The JET 1221VS uses a combination of three drive belt positions plus an electronic control to control the rotation speed of the 120 volt DC motor. The three belt positions result in three spindle speed ranges (60-900 RPM; 110-1800 RPM & 220-3600 RPM). Speed within each range is controlled electronically and set by a small potentiometer knob on the control panel. A digital readout displays the rotation speed of the lathe spindle. Does this lathe come with a stand? No The stand is extra. What chucks are required and what collects? Does jet make tool sets? BEST ANSWER: Standard chucks as for most lathes. I use a Nova 4 jaw chuck. I don't think Jet makes tools. Most of mine are Robert Sorby tools. You capn turn without any chuck if you want. It call turning on center and everything you need cone with jet lathe. To sure bowl or boxes you will need a chuck. There are many difference options available depending on your budget. As far as size it need to be compatible with the head stock which is 1inch 8thread per inch. I don't know if jet sell tool set but they are available from a host of suppliers including Rockler. I really couldn't tell you to be honest, I've been looking for chucks for years and years now I'm sorry that I don't know the answer but if you find out I'll be asking you then. My best advice is to call jet and they can shed some light on the situation. what is the dia. 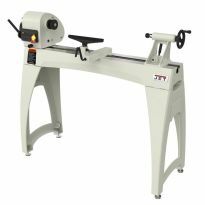 of tool rest that fits into a jet 1221? Can I buy a bed extender for a 1221 without the floor legs as mine is mounted on a bench? BEST ANSWER: You can purchase the bed extension without the additional stand. It bolts on to the right side of the lathe and has it's own support foot for bench top application. Is there a bed extension for the Jet 1221? BEST ANSWER: Yes, I’ve not added too this unit. But planning a future addition later. Can the headstock be rotated 180 degrees to turn larger bowls? BEST ANSWER: No, it would take major modification to rotate the headstock. 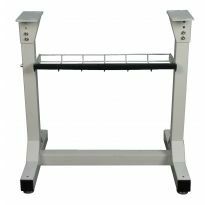 Stand extension 719203A is not available any more,how do you support the bed extension on a Stand?